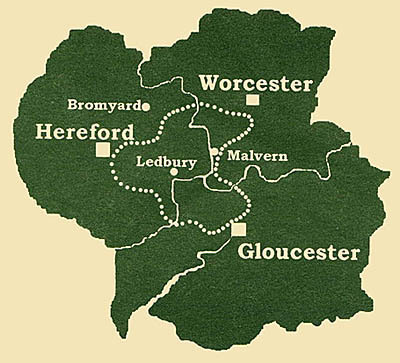 A long distance footpath between the cities of Gloucester, Hereford, and Worcester, with a theme of poetry and music linking the walk with the Music Festival celebrated at the three cathedrals for over 300 years. The attractive and varied countryside of the three counties provides a glorious walk of 100 miles through a region of hopyards, vineyards and orchards. Turning northeast from the cathedral, the Way undulates between valley and village to cross the Teme at Knightwick, before passing the birthplace of Elgar, historic stalwart of the Music Festival, to reach the Severn and cathedral at Worcester. The primeval ridge of Malvern is indisputably the route of choice from Worcester. Prominent throughout the walk, the ridge, in turn, provides an exhilarating panorama over the countryside of the Three Choirs Way. Seen from Chase End Hill at the ridge end, Gloucester and the serpentine Severn mark the end of a splendid walk through the three fair counties - a region of hopyard, vineyard, and orchard still.